Our collection of Mosser Glass milk glass tableware at Distinctive Decor includes highly collectable items hand-pressed in this milky white opaque glassware. The opaque white color makes our milk glass cake plates, bowls and nesting hen sets a choice that complements contemporary and traditional home decor. 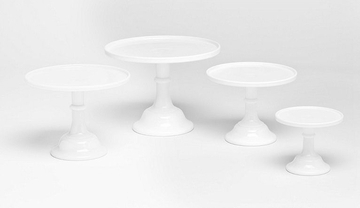 American-made Mosser Glass footed cake plates, a favorite of wedding and other special event caterers, are elegantly designed in milk glass for this collection. A favorite of Mosser Glass collectors is the two-piece nesting hen set in milk glass. The bowl's raised pattern resembles a nest, and the detailed lid is in the shape of a hen. We also have three-piece milk glass mixing bowls.